Senate Democrats are still holding the floor in a 24-hour push to derail Betsy DeVos’s nomination for Secretary of Education, which for absolutely no logical reason will likely squeak through anyway. 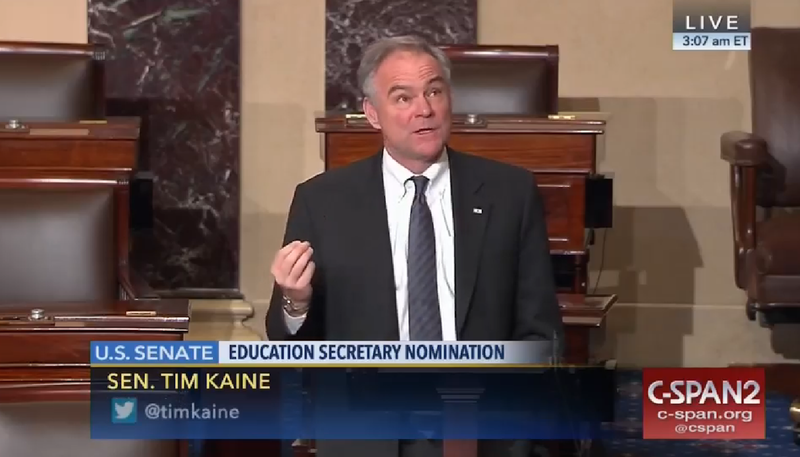 During Sen. Tim Kaine’s shift in the wee hours of the morning, the Virginia Democrat reminded the room of one of the original purposes of the voucher system DeVos supports: segregation. Today’s voucher advocates aren’t explicitly advocating segregation, of course, but vouchers funnel taxpayer funds away towards private and religious schools (it would appear that for DeVos, the emphasis is on the latter) that enjoy little oversight. In DeVos’s home state of Michigan, she was not successful in pushing a voucher system, but in the meantime she funded a relentless campaign to expand the state’s for-profit charter system and derail attempts at regulation; the New York Times reported that this helped lead to what one critic called “a total and complete collapse of education” in the city of Detroit. Detroit Public Schools overall rank last out of large urban school districts nationwide for the performance of African-American students in eight-grade math. But the majority of charter districts statewide perform even worse than the city school district for African-American students in eighth-grade math, the report noted. DeVos’s confirmation vote is scheduled for noon today. Unless a third Republican has a last-minute change of heart, Vice President Pence is expected to use a historic tie-breaking vote to confirm her.